X-ray fluorescence spectroscopy, one of the most powerful and flexible techniques available for the analysis and characterization of materials today, has gone through major changes during the past decade. Fully revised and expanded by 30%, X-Ray Fluorescence Spectrometry, Second Edition incorporates the latest industrial and scientific trends in all areas. It updates all previous material and adds new chapters on such topics as the history of X-ray fluorescence spectroscopy, the design of X-ray spectrometers, state-of-the-art applications, and X-ray spectra. Ron Jenkins draws on his extensive experience in training and consulting industry professionals for this clear and concise treatment, covering first the basic aspects of X rays, then the methodology of X-ray fluorescence spectroscopy and available instrumentation. He offers a comparison between wavelength and energy dispersive spectrometers as well as step-by-step guidelines to X-ray spectrometric techniques for qualitative and quantitative analysis-from specimen preparation to real-world industrial application. 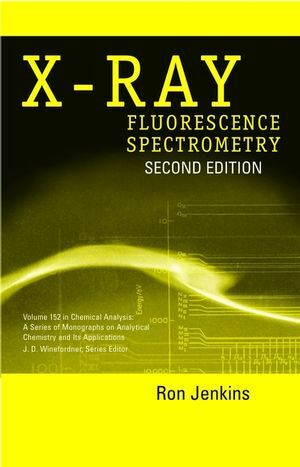 Favored by the American Chemical Society and the International Centre for Diffraction Data, X-Ray Fluorescence Spectrometry, Second Edition is an ideal introduction for newcomers to the field and an invaluable reference for experienced spectroscopists-in chemical analysis, geology, metallurgy, and materials science. * The history of X-ray fluorescence spectrometry-new to this edition. * A critical review of the most useful X-ray spectrometers. * Techniques and procedures for quantitative and qualitative analysis. * Modern applications and industrial trends. * X-ray spectra-new to this edition. RON JENKINS teaches at the Inter-national Centre for Diffraction Data. History and Development of X-Ray Fluorescence Spectrometry. Comparison of Wavelength and Energy Dispersive Spectrometers. More Recent Trends in X-Ray Fluorescence Instrumentation. Use of X-Ray Spectrometry for Qualitative Analysis. Considerations in Quantitative X-Ray Fluorescence Analysis. Quantitative Procedures in X-Ray Fluorescence Analysis.